Two titans of the superhero genre square off for the first time on the big screen in Batman v Superman: Dawn of Justice, a needlessly dour and overwhelmingly senseless affair that hopelessly squanders an intriguing premise. Director Zack Synder’s follow-up to Man of Steel is one of the most distracted and disjointed action films I’ve ever seen: a result of way too many ideas being thrown around carelessly with no guiding vision. Even the incoherent plotting and the muddled character motivations could have been overlooked if this movie was any fun but it even manages to forget how to have a good time at all. We pick up two years after the events of Man of Steel, where a devastating battle at the heart of Metropolis has led to intensified scrutiny surrounding Superman (Henry Cavill) from numerous parties. Most notable among his newfound objectors is neighboring city Gotham’s Bruce Wayne (Ben Affleck), who views him as a lawless alien and an imminent threat to the safety of the entire planet. After being coaxed by Metropolis business magnate Lex Luthor (Jesse Eisenberg), Wayne seeks an opportunity to face off against Superman as Batman and save their collective cities from any further destruction. I’ve intentionally left out the innumerable contrivances that lead to these two figures being pitted against each other but it’s important to reiterate just how overstuffed and out of control this narration is. Characters are introduced and re-introduced at such a breakneck pace that plausible development and motivations don’t have a chance to manifest themselves organically from the story. If you don’t already have at least a passing familiarity with most of these comic book characters, I can’t imagine how confusing this movie will be for you. Each scene vacillates so wildly from one narrative thread to another without the slightest sense of tactful cohesion or thoughtful storytelling. 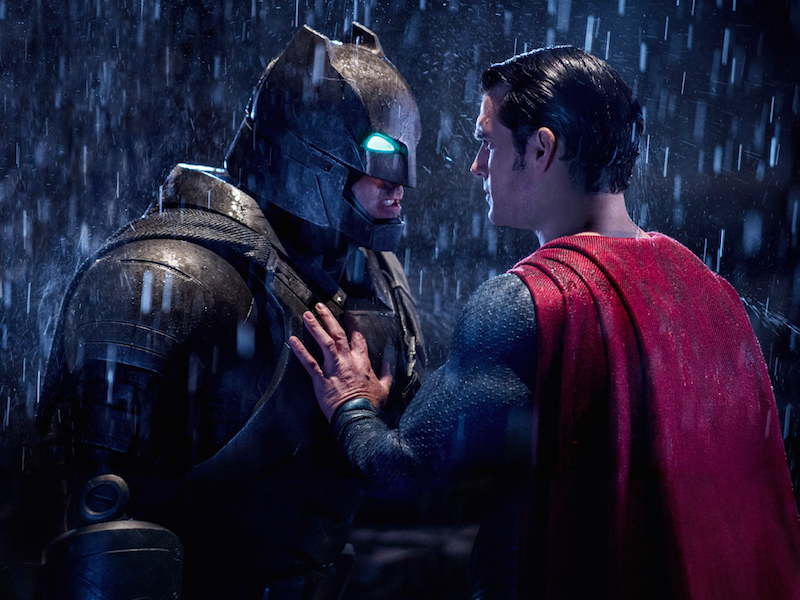 There’s just no time for anything meaningful in Batman v Superman. Beyond the whirlwind of narrative disconnect, just about any shred of spectacle or wonder is undermined by the oppressively brooding nature of the film’s look and feel. Zack Snyder collaborates with his go-to cinematographer Larry Fong to create a vision of Gotham and Metropolis so glum, it makes Christopher Nolan’s Batman trilogy look positively buoyant by comparison. I don’t have a problem with dark storytelling in comic book adaptions (recent Netflix series Jessica Jones did an excellent job of this) but it’s not enough to just be “gritty”: there has to be an underlying intelligence that informs the stylistic choices. I sat through Batman v Superman thinking “why does something like The Avengers work so much better than this?” It turns out that there are plenty of answers to that question but most importantly, Marvel has done an excellent job in taking their time to flesh out their characters before bringing them all together. Clearly this is DC’s attempt at creating their own version of the Marvel Cinematic Universe but they spend so much time trying to bring these superheroes together that they forgot to create a standalone movie that’s worthwhile on its own merit. It seems comic book fans will need to wait a bit longer for a film that does their legacy justice.